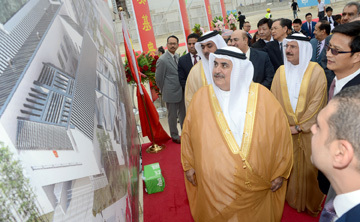 (Manama) – Foreign Affairs Minister Shaikh Khalid bin Ahmed bin Mohammed Al Khalifa has joined the Ambassador of the People’s Republic of China to the Kingdom of Bahrain, Qi Zhenhong, in laying the cornerstone for China embassy building in Bahrain. On this occasion, the minister extended his sincere congratulations to the People’s Republic of China, praising the advanced level of friendly relations between both countries, especially after the fruitful visit of His Majesty King Hamad bin Isa Al Khalifa to China. The minister also lauded the important role being played by China in cementing world peace, stability and development and looked forward to further developing bilateral relations building on the accomplishments of the royal visit and working on peace and security in the region and the world. 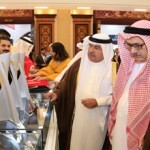 The Chinese ambassador expressed his thanks for the continuous support he receives from the Kingdom of Bahrain and expressed his country’s appreciation of the strong bilateral relations between both countries, wishing Bahrain continued progress and prosperity.